Duck was appointed as a director in May 2017. He has previously served a number of terms as a director of MG Corporation. Duck is a well-known Kununurra businessman and a Gajerrong man. 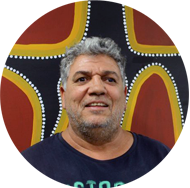 He owns Wannawork Contracting Services, which provides Aboriginal labour hire, and Jangala Civil, which provides plant hire. Both organisations have played a critical role in the Ord East-Kimberley Expansion Project. Born in Wyndham and raised in and around Kununurra, Duck is focused on promoting sustainable training and employment outcomes for MG people. Duck was awarded Person of the Year in 2011 as part of the East Kimberley Aboriginal Achievement Awards.